Yesterday, a CEO of a mall holding company spouted off about Amazon opening up brick and mortar stores. Like, three to four hundred of them. Naturally, the internet exploded, and then exploded again when Amazon declined to deny the comment. This morning, someone saw a squirrel and everyone has moved on, but there is still some speculation about what is going to happen if Amazon decides to massively enter the retail store market. Well, from where we’re sitting, probably not much will change. And why is that? Because a successful independent bookstore is more than just a bunch of shelves and a cash register. Sure, deep discounts are always a treat, and watching drones take off from the parking lot will be fun for awhile, but what makes a bookstore more than a “store” is the people who work in it and the people who come visit. A bookstore is a community center. Which is part of the reason we have comfy chairs scattered throughout the store. Shakespeare and Company, which purports to be at the very heart of Paris, has a tiny bed tucked away in one of the book-lined rooms upstairs. It’s where any number of authors have spent the night over the years during their early years of being itinerant artists. Third Place Books, which has several locations in the Seattle area, proclaims their advocacy of this idea in their very name. Bookstores are more than portals to imaginary worlds and libraries of ancient history. They are warm-blooded grandmamas who always hug you tight, no matter how craptastic your day has been. They are nimble-fingered grandpapas who will show you how to make kites, model rockets, and fishing lures. And anytime someone says, “Well, 94% of people who read this book rated it four stars or more,” you’re not in a bookstore. You’re at a kiosk, interfacing with a complex computer algorithm that has no idea who you are or how your day has been going. When was the last time someone shoved their ereader through your mail slot with a sticky note that you should read the book they just finished? We’ve wandered into February now, which means most of us have moved past the initial shock of the new year, and we’re starting to settle into the routines we’ve decided to adopt for 2016. For some of you, that means you’ve got yourself a book club. We know this because we’re starting to have multiple requests for titles that have been out for awhile. And because we’re delighted about all of this community around books, we’d like to help even more. We see more titles every month than we have space for on the shelves, and regularly someone on the staff opines that a certain book would be great for a book club. We’re working on a book club event for later this year, but in the meantime, please let us know if you have a book club or if you’d like to be in one. Let’s start a conversation about sharing our mutual love for books. 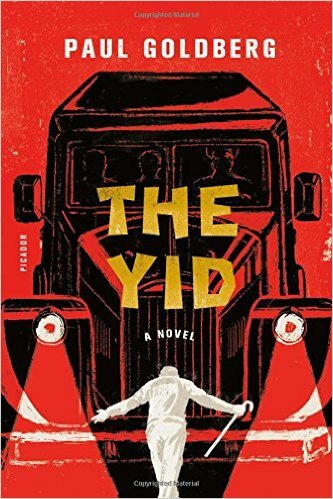 Continuing our minimalist 'One Book One Week' theme, we offer you the cover to Paul Goldberg's new novel, The Yid. You'll just have to come in and find out what it's all about. A Good Book is located in downtown Sumner, and carries both new and used books. Curated by readers and writers, there's a book for everyone here at the store. And don't forget the large kids' section upstairs! Colby: It’s Valentine’s Day next week. Did you get something for Alice yet? Bob: I’m working on it, marmot. Don’t pressure me. Colby: I’m just trying to be helpful. Bob: Well, go be helpful back with the fishing books or something. Colby: I re-organized those yesterday when you snapped at me. Colby: I did that section, too. Bob: Your efficiency is annoying me. Colby: I am saddened to realize that the mere fact of your annoyance no longer saddens me. I have become inured to your passive mean-spiritedness. Bob: Don’t make that noise. You don’t have the lung capacity to sigh like that. It just sounds like . . . it sounds like a balloon farting. Colby: Even your lackluster hyperboles do not move me. Perhaps I will wander off and find a book to read. Bob: Wait! Are you saying that I’ve become . . . cliche? Do you even know what a cliche is, marmot? DO YOU? Colby: [faintly, from the back of the store] I can’t hear you, shouty man. You might enjoy the mailing list Archive.